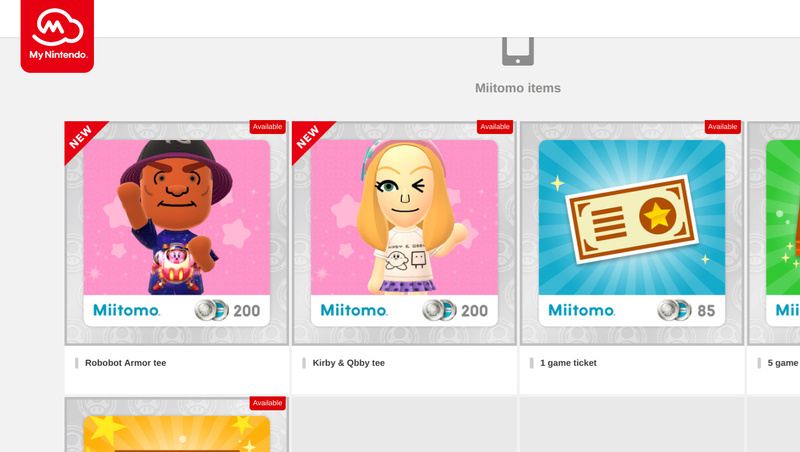 If you've got a wealth of coins to spend on your My Nintendo account then you might want to visit the rewards site today as some new items have just gone live. For 200 coins you can get either a Kirby Robobot Armor T-shirt or Kirby & Qbby (of BOXBOY fame) T-shirt, both of which can be used in Miitomo. In North America, a Yo-Kai Watch 2 3DS theme featuring the one and only Jibanyan is also available. The game went live for pre-load yesterday, in case you missed it. Let us know what you think of these new rewards by posting a comment below. Thanks to WhiteKnuckle for the tip! Lame. And again, the rewards are geared more towards 3DS owners. A 15% discount on MK8 is both measly and pointless as the majority of Wii U owners already own it. Well... maybe Nintendo will realise how to make this thing good soon! Themes are always appreciated. Miitomo rewards not so much. I'm praying that next month brings a decent amount of rewards to redeem our coins for. Hope for the best, expect the worst. North America still doesn't have My Nintendo Theme 4: Samus for some reason. If it was a matter of hating Metroid, I don't think it would've been made in the first place. The Yokay Watch theme is aviable also in Europe. @YouSeemFRAZZLED I'd be more surprised if Japan already got it and we didn't, considering that the Metroid series is less successful in Japan than it is in western countries. Edit: Okay, to be less terse! The offerings aren't of use or interest to me. @YouSeemFRAZZLED Then I am indeed pretty frazzled. I bought the Kirby & Qbby tshirt because I had nearly 5000 Platinum points and nothing to spend them on. I've got 425 that will expire at the end of November so hopefully we will get some more decent rewards soon instead of stuff that I already own! Nintendo, customers like these are the ones you should fight to keep! Bring out dormant franchises for NX! @Mega_Yarn_Poochy I'm trusting you. Can you share the master plan. Will they give us themes for the NX homescreen to redeem. Will they at least give us digital games. I'm sorry Nintendo. I really should have put more thought into those surveys. This is my punishment, isn't it? 2. My Nintendo will allow for cloud saves between connected devices (possibly only NX <--> WiiU/3DS) - BotW and Just Dance 2017 are currently confirmed for both the Wii U and NX so they will both be able to be saved to the "cloud"
I have a few other, less obvious things, but I'm a bit pressed for time, so I'll add a few things later. Yeah, let me know when they do something about the three meager Wii U offerings Gold Coin purchases that have been there for quite some time? So far coins in general have proven to be useless for a Wii U owner like me as I pretty much already own everything they offer "discounts" for and the games available never change. Overall the system seems pretty much a waste of space and time. @bezerker99 That theme is awesome! I downloaded it yesterday. Themes and miitomo items? No thanks. @Mega_Yarn_Poochy thanks for trying. You should work for Nintendo. So now what it means is they just don't care about the wii u and just need time to pass. Sure it is only for my Mii in Miitomo, but it is Kirby merchandise! Kirby Cafe, at that! (I need to go to Japan some day and visit that Cafe!) I must get every single one. Too bad they are stuck in Miitomo land and will eventually vanish whenever they pull the plug on Miitomo, but thats the life of digital goodies. European somehow looks more empty than usual... The discounts aren't tempting and the better stuff is either for WiiU (which I don't have) or for gold coins (hard to collect them if you own like every game you wanted from eShop by now). But there's a new theme, better than nothing? (No miitomo wear here and I by now doubt we will ever get it). I got the Jibanyan theme. Finally something that I'm at least semi-interested in! I suppose there's irony in the fact that the "loyalty" program ignores the most loyal fans. Miitomo has been very successful at being worthless. Club Nintendo may have spoiled us, but it created a standard that appears Miitomo won't come close to. I downloaded it, deleted it, gave it another attempt and deleted it temporarily until Nintendo gives me a reason to engage with it. Outfits, themes and lousy discounts, no thanks. Maybe I I'll try again later in life. I just grabbed the 3DS theme. I'm not terribly interested in that series but it's better then the Miitomo shirts. "For 200 coins you can get either a Kirby Robobot Armor T-shirt or Kirby & Qbby (of BOXBOY fame) T-shirt, both of which can be used in Miitomo." FINALLY - Wohooooooooooooo, was waiting and praying for this for the whole year. Finally - the RESURRECTION. What you say now "Mittomo is Garbage" haters? Nobodys laughing now when getting these awesome rewards. Nobody will ever again say "I rather sniff around the street with my dog for treasure than collecting any more of these worthless coins" .. these times are over, cause when you think the rewards & Nintendo cant sink any lower, they turn things around and TOTALLY REDEEM themselves. Thanks Nintendo, I go and kill myself now. I remember when miitomo was going to be nintendo's savior, everyone was going to be so excited for nintendo again. It was such a great mobile app. Miitomo is still not avaliable in Scandinavia. C'mon, where's the Metroid theme for North America? I've been waiting for that one. I sent in something about the Yo-Kai Watch 2 theme yesterday (and already redeemed it), but the Kirby-themed Miitomo gear wasn't up yet. I don't like Kirby or Boxy whatever, so I don't want these. I agree that My Nintendo was made for the NX, but why can't it also support physical Wii U and 3DS games? Also, why are there no physical rewards? @Ikramali It seems a lot of people think I should be hired by Nintendo/Game Freak for one idea or another. But yeah, this isn't what I think Nintendo should do, it's what I think Nintendo will do. The clues are all there, and while I may not be 100% correct, everything says that this will happen. It's Nintendo's master plan to come back into the spotlight, and, unfortunately, it involved the sacrifice of the Wii U. Some other stuff I can say is that they will announce it before November 10th and it will a console- no handheld component or anything. I just wish there was something to use my gold coins for. I travel around for work so I am mainly downloading these days and have built up about 700 gold coins but there is nothing to spend them on! I thought we'd get another Wii U discount after Donkey Kong TF finished, but nothing so far. Maybe they should make it so that you can buy platinum rewards with gold coins too, especially since they are free.